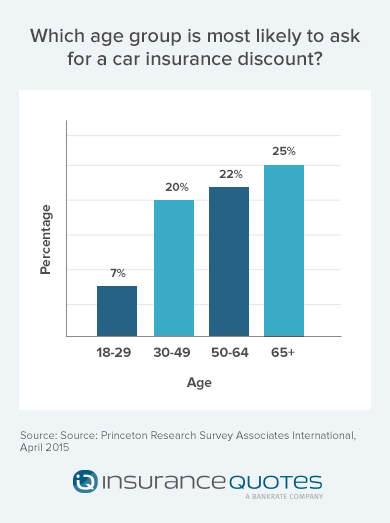 A new Princeton Survey Research Associates International study found that just 16 percent of Americans have asked their car insurance provider for common discounts -- meaning millions of dollars of potential savings have been left on the table. You may qualify for a number of auto insurance discounts, but not receive them because you haven't asked. If so, you have plenty of company. 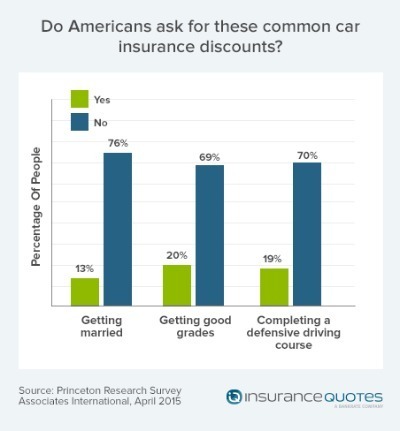 A new Princeton Survey Research Associates International study, commissioned by insuranceQuotes, found that just 16 percent of Americans have asked their car insurance provider for common discounts -- meaning millions of dollars of potential savings have been left on the table. You're likely to receive many discounts without asking -- such as those for bundling several insurance policies with one insurer, remaining a loyal customer or remaining accident free over a period of time. Having no commute or a short commute. Paying your renewal bill in advance. Having a bachelor's degree or higher. Working in some types of jobs, such as teachers and police officers. Countless Americans miss out on one key discount: The low-mileage price break. For example, perhaps you just moved from the suburbs to a new apartment within walking distance of work. Your car, which you previously drove 20 miles a day, is now sitting idle in the garage. A mileage study by Quadrant Information Services -- and commissioned by insuranceQuotes.com -- found that someone who drives 5,000 miles a year pays a national average of 8.4 percent less for car insurance than someone who drives 15,000 miles a year. While 15,000 miles may sound like a lot of driving, it's actually just slightly more than the 13,476 miles the average American drives annually, according to the U.S. Department of Transportation. This difference was even wider in some states, with low-mileage drivers in California among the biggest winners. Washington, D.C. -- 11.1 percent. North Carolina - 0 percent. Rhode Island -- 3 percent. Loretta Worters, vice president of the Insurance Information Institute, says there's a logical reason why car insurance companies increase premiums for people who drive more miles. "It's all about risk," she says. "The more miles driven, the greater the chances of being involved in an accident." Insurers in some states are especially likely to put a greater price on driving more miles. For example, California insurers probably charge especially high rates to high-mileage drivers because the Golden State has so many motorists on the road, says Robert Passmore, assistant vice president, personal lines policy for the Property Casualty Insurers Association of America. "The more marbles in the jar, the more likely they will bang into each other," he says. Because insurers can base rates only on these three factors, it "tends to magnify" the impact of driving mileage, Passmore says. Douglas Heller, an insurance expert and consultant who works closely with the Consumer Federation of America, says charging higher rates to people who drive more miles is among the best and fairest ways to price policies. He says basing rates on the number of miles you drive makes far more sense than other criteria some insurance companies use, including your income and level of education. At the other extreme, experts could not say precisely why insurers in North Carolina and other states would virtually ignore miles driven when pricing policies. Wayne Goodwin, North Carolina insurance commissioner, says it's likely that an increase in mileage doesn't raise risk levels in North Carolina as much as it does in California, since the Tar Heel state is more rural and has fewer drivers on the road. However, he says the state's unique rate-setting formula is an even more significant factor in keeping insurers in North Carolina from ramping up premiums in tandem with miles driven. Unlike in other states -- where insurers individually file rates with their state's insurance bureau -- all insurers operating in North Carolina file rate requests with an organization known as the North Carolina Rate Bureau. The bureau then proposes one statewide base rate on behalf of all the companies. Goodwin's office then accepts or rejects the request and sets a dollar cap on how much insurers can charge consumers. He says his office has instituted a dollar cap on the amount that insurers can raise rates based on miles driven. However, there's no limit on how big a discount insurers can offer for driving fewer miles. "Miles driven is a rating factor, but it doesn't have a major impact," he says. He adds that the North Carolina system has kept auto insurance rates low in the state. North Carolina has the seventh-lowest premium insurance costs in the country, according to the latest figures from the National Association of Insurance Commissioners. If you're among those driving 5,000 miles annually or fewer, make sure to alert your insurance company to the fact as you're likely to receive a low-mileage discount. However, many low-mileage drivers are likely to be missing out on discounts. The Princeton study found that just 18 percent of drivers had ever informed their car insurance company that the number of miles they drove per year changed from what they previously reported. Of course, not everybody can simply reduce their mileage to save money. Avoid getting tickets for speeding and other moving violations. Get several price quotes when shopping for insurance. What happens if you lie about your mileage? Because insurers tend to raise rates on higher-mileage drivers, policyholders may be tempted to fudge the number of miles they drive. But in addition to being unethical, such a decision can backfire on the policyholder. For example, a driver may say he only drives 5,000 miles a year when signing up for coverage. He likely will have to report the odometer reading at that time -- for example, 10,738 miles. 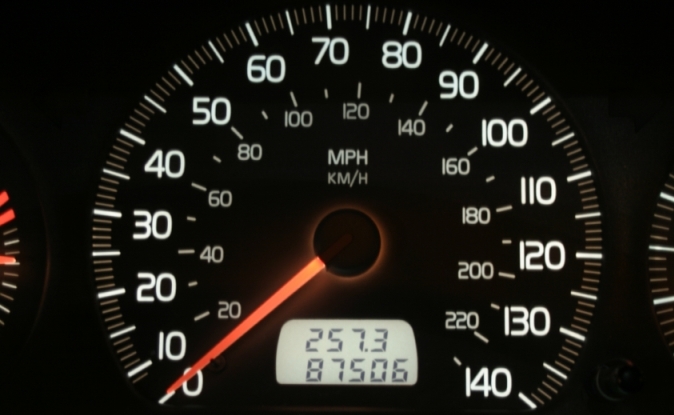 If an accident occurs six months later, and the driver's mileage is 19,458 -- far above what would be expected for someone who drives 5,000 miles a year -- trouble may ensue. In such cases, coverage can be rescinded back to the time the policy was put into place. Passmore reminds drivers that lying to their insurer is illegal. "That's insurance fraud," he says. "Honesty is the best policy."